Melissa C. Water was born and raised in a small town in Quebec, Canada. She grew up trying to write novels but never finished them. Her High school English writing teacher inspired her to continue to write poetry and stories, and also inspired her to believe in her abilities as an author. 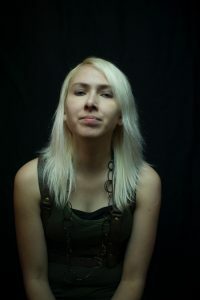 Melissa Wrote her memoir of her time in a psychiatric ward for self harm and bulimia, as well as writing a comical yet dramatic science fiction series for young adults. Today Melissa lives in Montreal, Quebec. She is a mental health activist that raises awareness on youtube for multiple mental health conditions as well as the neurological condition known as Tourette Syndrome. She is known on youtube as Idranktheseawater. I’ve always kept stories in my head and thought poetically. I grew up with fantastic tales spinning through my mind. I loved to write and dream of a day that my words would fill a published book. I think a lot of the readers and how to make words beautiful for them to read. With my memoir, I turned my extensive journals into a novel. It was a lot of work but much simpler than the science-fictions I created. I wrote out a plan for each chapter where I detailed events and conversations. I would note the foreshadowing or introduction or climax. I would write my entire novels by hand before inputting them into the computer. I still have the binders full of my original words and they mean so much to me. Yes. I would think up scenarios and sometimes laugh to myself at the conversations that the characters would have. I found myself laughing in the streets a few times at the jokes I would input into the stories. Don’t give up. Even though that first or second novel only saw a few pages or chapters, it’s still steps towards the book that could see print. Write because you love it and in time your words will evolve into a weave of a story that could spellbind an audience. It was my dream to be a published author since I knew how to write. I would write short stories that my mother would bind together between thick cardboards. I still have those books and treasure the feeling I had while growing up that my words could one day speak to someone. I live and breathe language. It’s beautiful. I feel a need to share that. I think the voices of Indie Authors are increasingly heard. Self-publishing isn’t what it once was and is not a measure of a mere small success. I sense publishing will be much easier to access. In a sense, the future is already here. I got to publish for free and share my words with thousands.